A: I wanted to buy Facebook stock, but they told me only millionnaires are permitted by law to buy pre-IPO stock. A: ...to be trusted with pre-IPO stock! But we can legally blow our money on a crappy used car or go bankrupt on an interest-only mortgage or Yahoo stock! B: What's he babbling about? I wish he would mumble in a bigger font so I could make sense of it. A: It makes no sense! B: It makes perfect sense to us millionnaires. 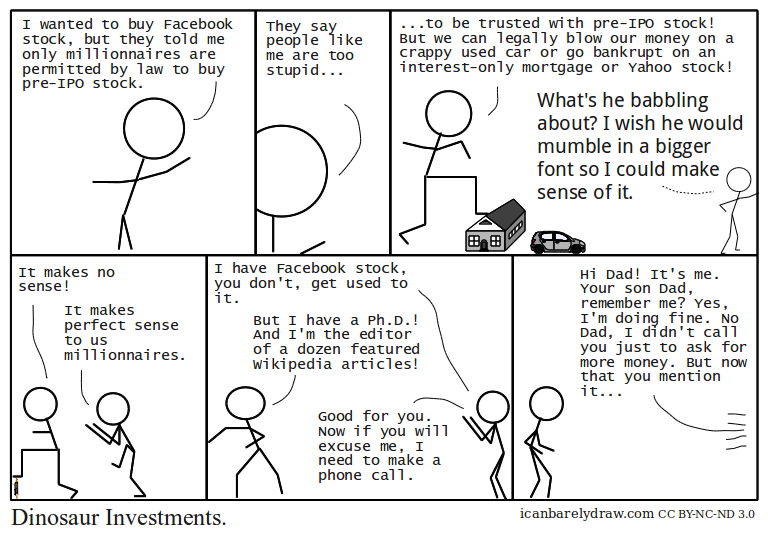 B: I have Facebook stock, you don't, get used to it. A: But I have a Ph.D.! And I'm the editor of a dozen featured Wikipedia articles!